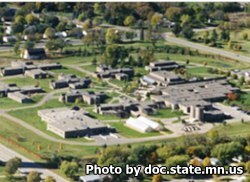 Shakopee Correctional Facility is a mixed custody facility that houses over 600 adult females. It was notable as being the only prison that housed maximum security women without a perimeter fence, but by spring of 2016 a perimeter fence will be completed and add increased security to the prison. Offenders who posed serious security and flight risks were often transferred to out of state facilities that were more secure, but with the new perimeter fence and other additional security enhancements, the practice of sending female inmates out of state is expected to end. Minnesota Correctional Industries provides part and full time employment to inmates who can work in culinary services and maintenance for the prison. Offenders can also participate in educational and vocational courses and receive mental health and substance abuse treatments. General population inmates have visitation on Wednesdays, Thursdays and Fridays from 4pm-8:30pm and on Saturdays and Sundays from 8am-2:45pm. You must arrive and register for visitation prior to the last hour of the visiting session.